Presort Lead Jameel Henricksen, right, and Sorter Jerome Thomas remove plastic bags at Waste Management's SMaRT Center in Spokane. 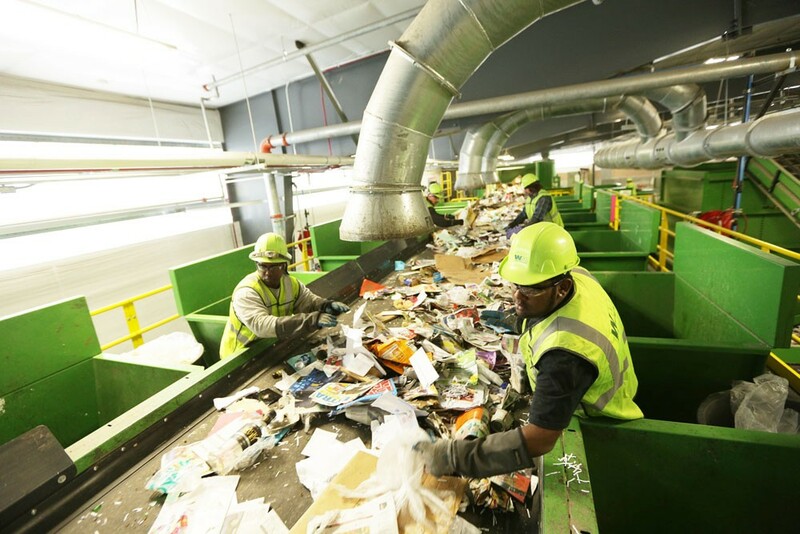 In this week's story about China cracking down on contamination in recyclables, we briefly mentioned that the changing regulations could inspire development of more recycling facilities locally, and at least one Pacific Northwest company already has plans for something big. While a lot of people may think we already have recycling plants here, mostly what we have are sorting facilities, which pick out garbage (but not enough of it: see this week's story for more on that), sort things by type, and bundle each type of item together to sell to mills in different parts of the country and the world. Much of that plastic collected in the Pacific Northwest, and the world, is sent to China to actually be melted down and made into new products (this is the recycling part). But you don't have to look further than Portland, Oregon, to find a plant doing that type of work here. Since 1983, Denton Plastics has been recycling plastics into colorful pellets that can then be used as a replacement for "virgin" plastic resin, explains Dennis Denton, the now semi-retired company founder, who is still chairman of the company's board. After a few decades of success with its first facility, Denton worked with the Oregon Beverage Recycling Cooperative to open the ORPET plastic bottle recycling plant in St. Helens, Oregon, in 2012. That facility takes a steady stream of plastic water and soda bottles that residents are encouraged to return as they get a nickel deposit per bottle back, according to OPB. Denton has since sold his interest in the ORPET facility, and Denton Plastics now has its sights set on building a new plant that could sort, wash, grind and prepare all sorts of high-density plastics to then be recycled at Denton's original plant. "The rest of the world has got to quit dumping on China and deal with their own recycling," Denton says. Even Denton Plastics has had to rely on China at certain points in its history to take some of the things it can't recycle at its own facility. "We exported about 30 percent of our scrap that we brought in," Denton says of when the company first started. "But then when we built the bigger more voluminous plant where we could take more volume, we have reduced our exports to China down to about 4 or 5 percent or less." And now, sorting technology has advanced enough that Denton can plan to open the new automated plant. One of the first things they'll need first, though, is a supply. "You can't build a sawmill without any trees," Denton says. "We’re in the middle of negotiating a guaranteed source of supply with our local government and we are actively seeking some help with the Closed Loop Fund as well." The Closed Loop Fund invests in recycling infrastructure and sustainable manufacturing, and is paid into by several large corporations, including Walmart, Coca-Cola, PepsiCo, Procter & Gamble and more. That type of public interest by companies is a relatively recent development in the recycling world, Denton says. "The customers that I got initially in the '80s would tell me they’d buy from me as long as I didn’t tell anybody I sold them the plastic, because everybody wanted virgin plastic only," Denton says. "So I had to keep my mouth shut. Now things have changed, now we have pools of people who demand it." The new facility will likely create about 50 to 60 jobs, Denton says. And if local materials recovery facilities can get the quality of their processes to the right specifications — "we don't want contaminants neither," Denton explains — he envisions the Oregon plants could "handle the entire Northwest." "We’re excited about the future because creating jobs domestically and handling things here is the right way to go," Denton says. The company is currently looking at industrial locations near Portland, and from the time things get "rocking and rolling," Denton says the facility could be up in about 18 months.